It is quite common for users to miss updating some fields in TrakIT. These could be header fields, events or data fields. This leads to incomplete shipment data, resulting in inaccurate or incomplete reporting to customers and others. With the latest update of TrakIT, we've implemented a new feature to help improve data quality. Events in a corridor can now require other data fields to be populated before TrakIT will allow the event to be populated. This can be set for each event independently via the Corridor Definition page. 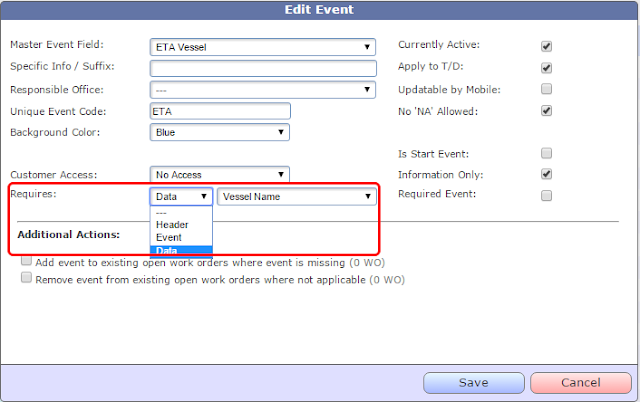 For example, you can specify that the event "ETA Vessel" can only be populated once the name of the vessel has been entered in the data field. Or, you can specify that the event "Loaded on Truck" requires that the Transporter has been specified in the header. Once a requirement is set, TrakIT will not allow an event to be populated with a date or "NA" until the requirement is met. It is, however, still possible to populate the event with "TBA". The size of Item List field for Data fields has been increased to 500 characters to allow for longer lists. When performing a bulk update via email, you can now specify and additional keyword "IgnoreSequence" (without space) in the subject line to disable sequence checking when updating events. This will work only for users with "PowerUser" role or above.